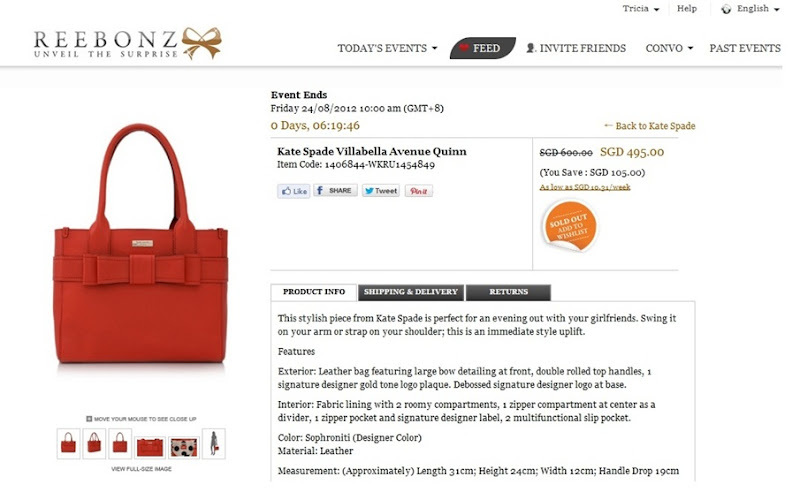 Over the past few months, there has been a huge buzz online over Reebonz. Have you ever heard of them? I for one, have never shopped in Reebonz before despite hearing my friends rave about the extensive spread of items they offer on their website and all the good deals in a form of an “event”. It is an exclusive online event where you are invited by an existing member to join and this is the heaven because you may find certain designs priced lower than what they offer in local boutiques. Finally jumping on the bandwagon, I signed up for an account with Reebonz and took a tour around their website. My senses heightened when I was greeted by this sleek signup page which was really captivating with the model in an iridescent white dress placed strategically at one end. 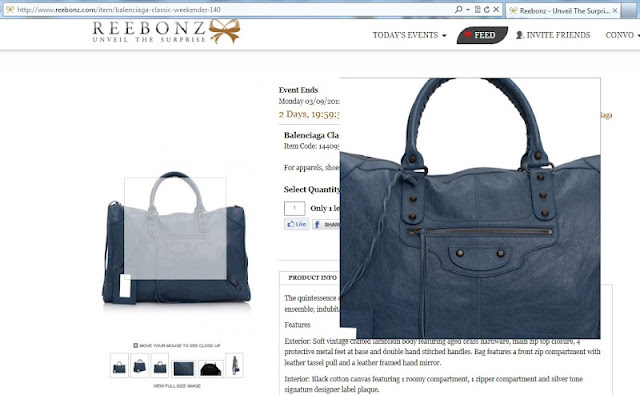 So what is Reebonz all about? 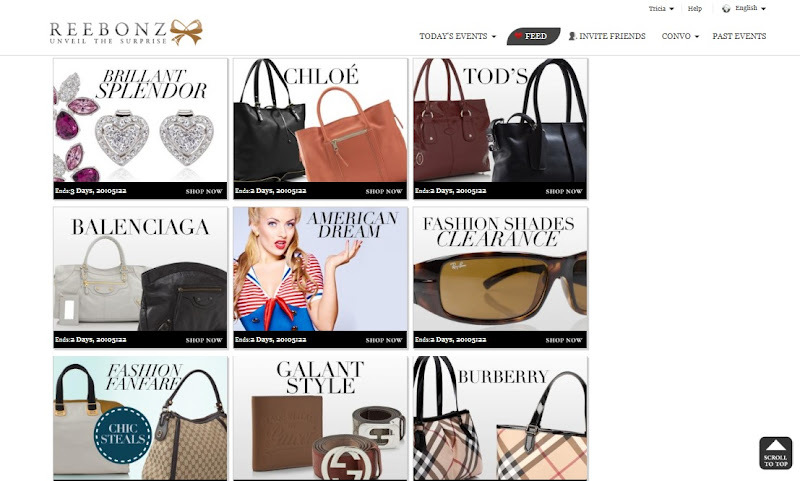 They are an online shopping platform that provides luxury products to their members. 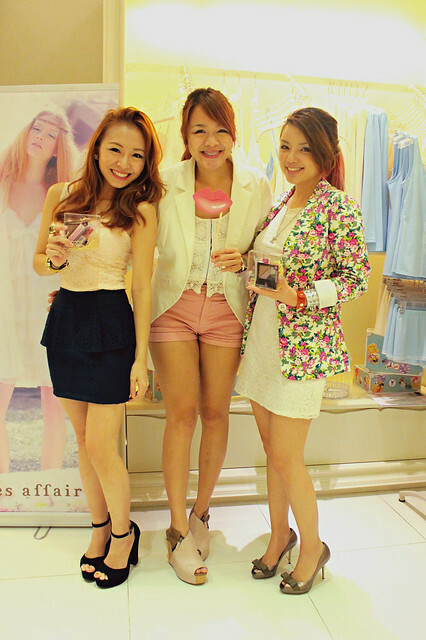 I was in awe of its comprehensive spread of items like handbags, apparels, accessories and shoes. With the wide selection of items, I was pleasantly surprised at how user friendly this website is. The range of items are grouped according to brands and they are all given a little tease on the cover photo which makes everything looks so enchanting. This pretty Bleu Cobalt Balenciaga Classic is priced at $1955.00, which was $105.00 CHEAPER than its retail price at $2060.00. It is a real pity that this stunning color is sold out already! The second item which caught my eye and it is in one of my favourite colors! 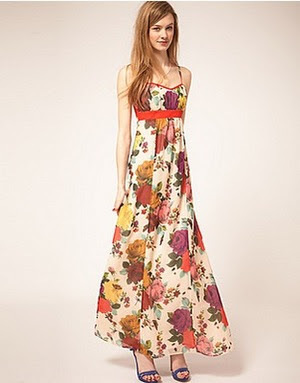 The Villabella Avenue Quinn from Kate Spade in Sophroniti. I really love its’ sleek and feminine bow design. It reminds me of my Ted Baker clutch (you would have seen it if you are following me on my instagram!). 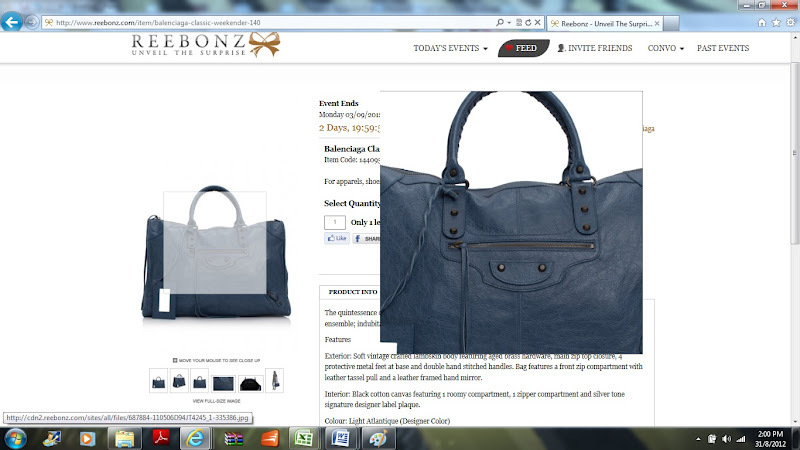 Coming back, I am truly amazed by its competitive pricing of the products in Reebonz! How do they manage to keep the prices so low? My first purchase from Reebonz came in a form of a pretty tassel earring in my favourite red. I really like how simple its check-out process is. But I better be quick! The things sell out really fast on their web! Just so you know, I am penning down this entry by literally going through my shopping process in Reebonz with you so I will end here to complete my shopping! 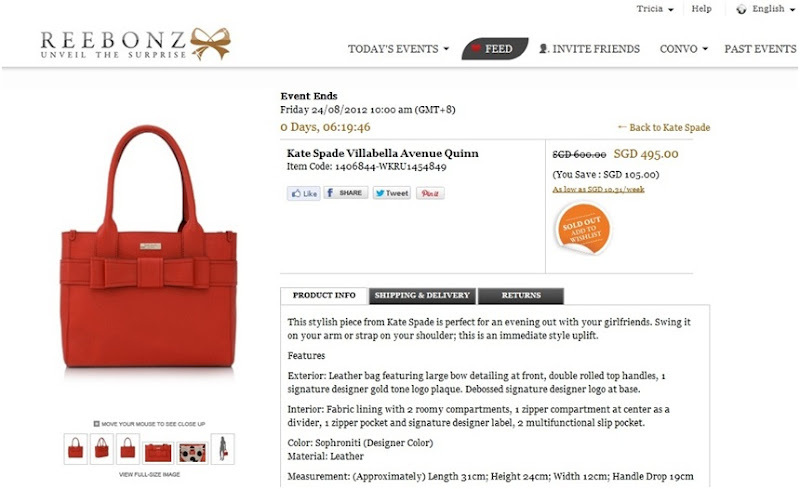 Invitation to Reebonz and all its events is only via invitation! So, here’s my exclusive invite to you and your friends! Let me know if you managed to snag any good deals because I heard there was a 99% discounted sale recently! Tuesday, August 14, 2012 :: Finally! A treat for the mane at Salon Vim! Just last week, I was demanded by John to head down to the salon to fix my hair because I have not had a cut nor treatment for as long as I can remember. I was dragging my feet around heading to Salon Vim a long time because I pretty much love my long hair (which took me 6 months to grow!) but John wants to give me a fresh look which he hinted will be much shorter than what I have at that moment of time. Of course and very naturally, I was beyond petrified haha. So I procrastinated until he went bonkers, and there I was, finally turning up at Salon Vim last Saturday. 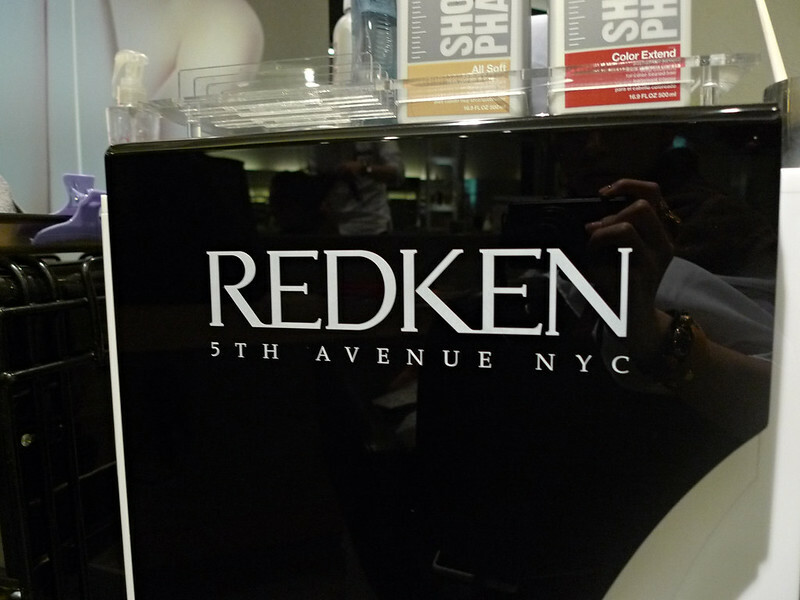 I have read and heard alot about the goodness of Redken chemistry cocktail treatment but having done it myself now, I have only good reviews for it! Was pretty intrigued about it after my treatment so I went online to find out more. 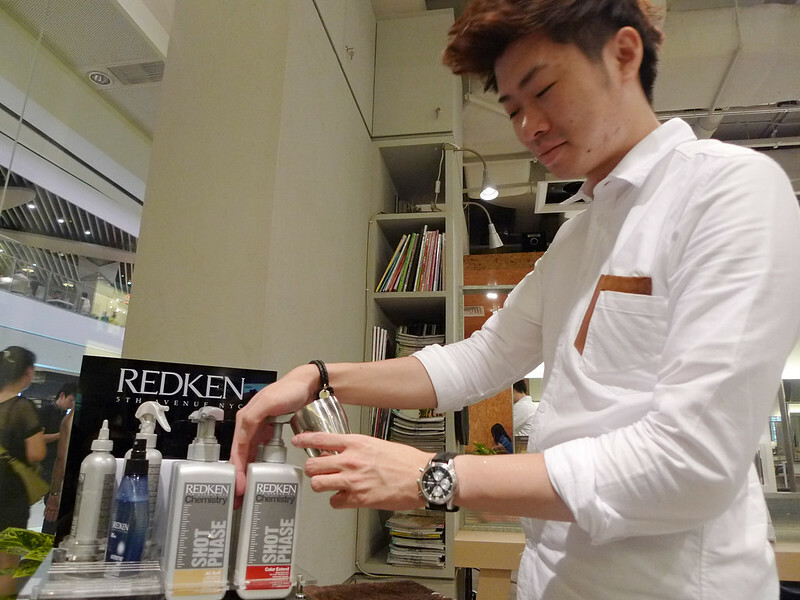 Mechanical distress is caused by normal wear and tear due to blow-drying, curling, flat irons etc. Very sadly, I am guilty of this as well thanks to my daily curling. Even though I am using my trustworthy BabyLiss curler, there is bound to be breakage and dryness in hair caused by extreme heat. 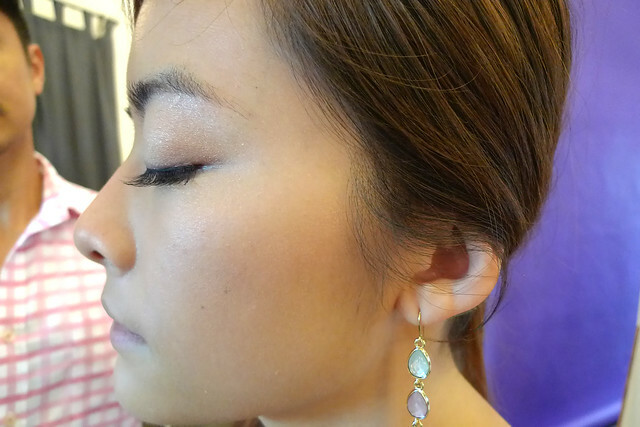 John explained to me that there are 6 shots that he can choose from to customize this treatment to my needs. 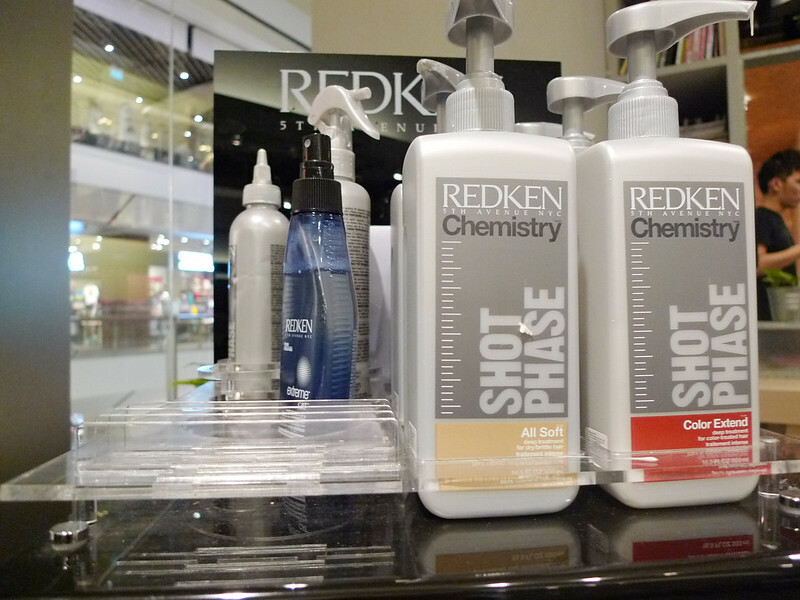 My cocktail treatment consists of 3 shots namely (1) Extreme Shot Phase for distressed hair, (2) Color Extend Shot Phase for colored hair and (3) All Soft Shot Phase for dry/brittle hair. 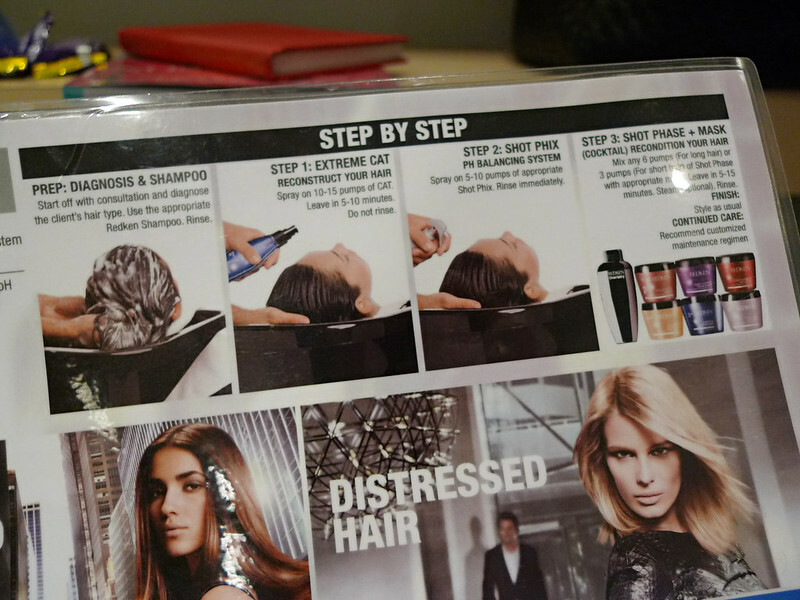 I especially love step 1 and step 2 where the chemicals prep your hair's pH level for maximum absorption during the treatment. 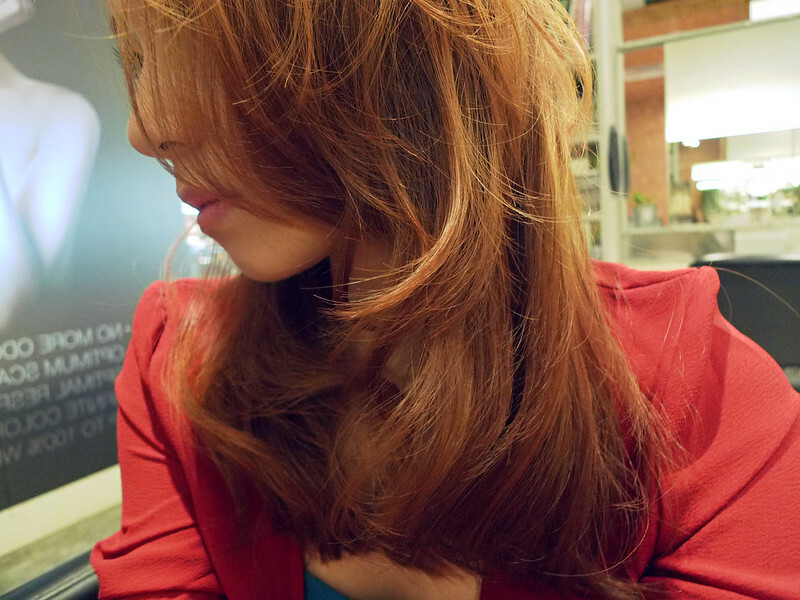 After the treatment, my hair was insanely smooth and visibly silky. There is also a "bounce" in my hair where it looks like my mane has a life on its own. It is incredible. 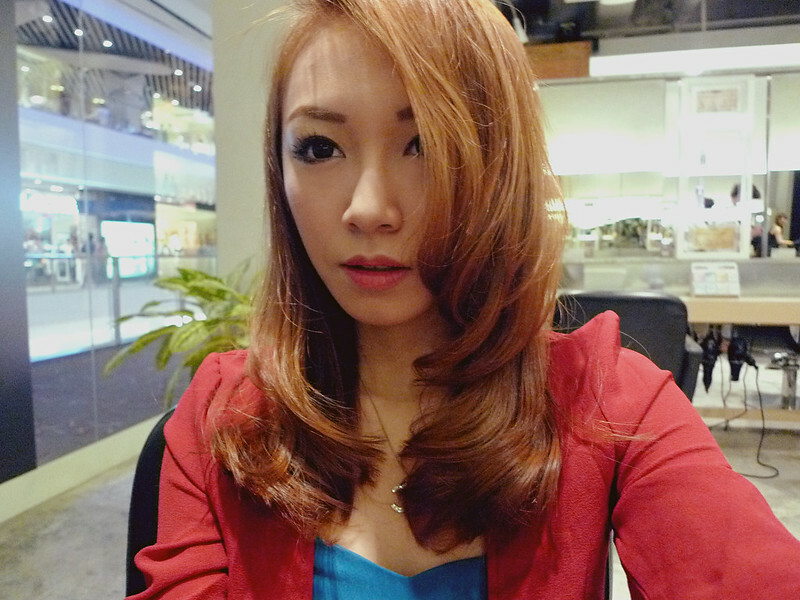 Each strand of my hair feels tougher and it definitely looks thicker than before the treatment. I have very little hair and my hair is considered pretty fine and weak. Imagine I can section my hair into 4 parts and curled it within 10 minutes. That is how little my hair is. So I was surprised my hair was visibly thicker even though I chopped off my locks and retouched my roots with a light color. Lighter color usually emphasizes the amount of hair you have. So if you have reallllyyy little hair, it is advisable to have darker colors. On another note, if you have a good stylist who also doubles up as a good colorist, you can safely go with lighter colors. I would say this because John gave me a different cut that is suited to my face and head shape. 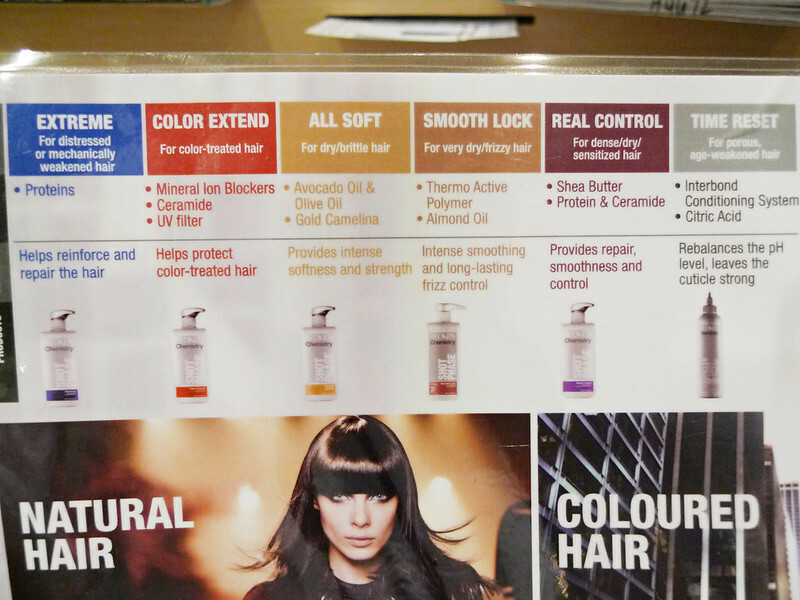 It acts to complement the color of my hair and also "adds weight" to it. The color on my hair is a special concoction by John and is not available on charts. That reminds me, VGY attended the Maybelline x Zouk event just last week and I was backstage when one of hairstylist from Chapter 2 actually commented my hair color was stunning. Geez..hehe. On a side note, John refuses to work on my hair during our wedding haha. But I am adamant on having him to do up my hair! Someone please help me convince him! Back to my haircut, I love how heavy my hair looks and the unique lengths although there was no thinning involved! Also look at how smooth and healthy my hair is! It has been nearly a week and my hair still feels smooth, tough and visibly healthy! Uploaded this photo taken using my iPhone onto instagram! 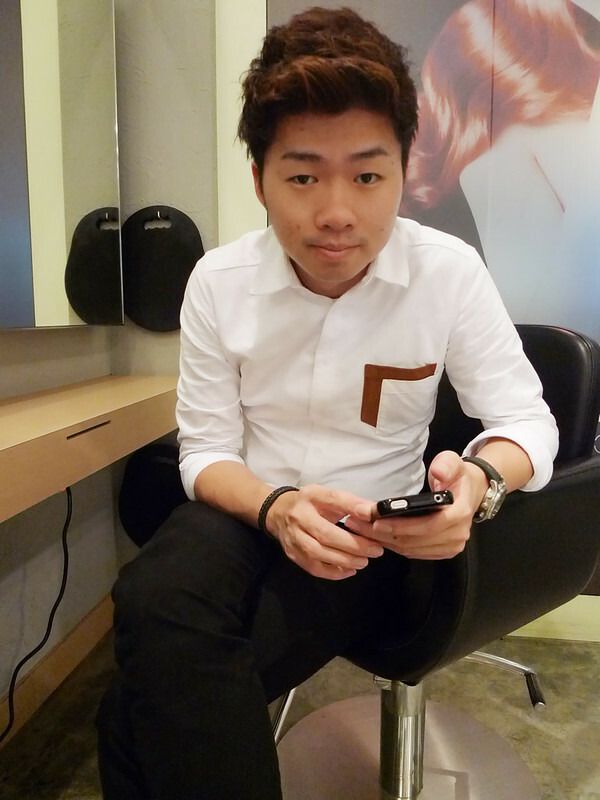 I highly recommend John at the salon if you are interested to give him a try! Drop him a call or text at 85229336. He is a smooth and friendly texter~ haha. Before I end off this post, please look forward to the big 100th VGY launch! 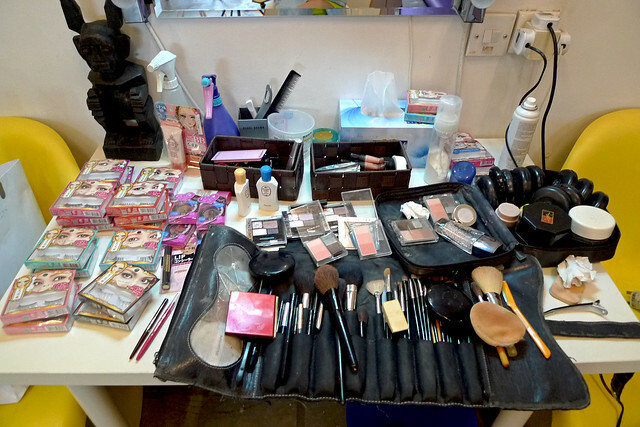 I am all geared up for the big 100th which I am aiming to launch next week, which coincides with VGY's birthday week! ;) I am planning a big surprise and it will be a great visual treat! I am keeping my fingers crossed because I have so many things happening next week! I need all the faith and strength to pull me through the busy week!